"NISSAN" is the sound of "Richan" in Rome. It means “the focus on the future of man and the car". The trademark is putting the word "NISSAN" on a fiery red sun. It shows the company name concisely. Meanwhile, this trademark highlights in the image of the nation. It is unique. The front wheel rim drive and the rear wheel rim drive are all disc design. The mechanical hand brake is also used. NISSAN wheel rim is made of steel. In addition, full size spare tire can be available. Wuxi Hengsheng Wheel Co., Ltd is a professional NISSAN steel wheel rim manufacturer and supplier in China. In addition to NISSAN steel wheel rim, we also provide other famous models steel wheels (rims) for our clients around the world, like JEEP wheel (rim), Kia wheels (rims), Lexus wheel (rim), Lincoln wheel (rim), Mazda wheel (rim), Mercedes wheel (rim), Volkswagen wheels (rims), Mitsubishi wheel, etc. 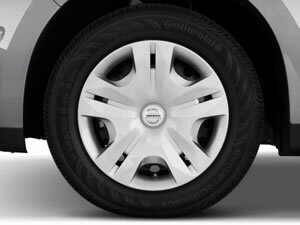 We possess a professional technology team to guarantee the manufacturing of NISSAN wheel rim. We will checkout all the products and give out a survey report. According to the needs of every client, there will be a dynamic balance sample survey among parts of the qualified NISSAN wheel rim.